Legrand Switches - L.I. 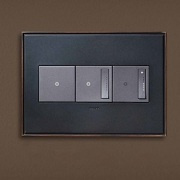 Modern Marble inc.
Switches and dimmers are at the heart of the adorne collection. Each features clean design and an infinitely helpful locator light to find it in the dark.Whether you favor a simple touch (like on your smart phone), a satisfying click, or even the simple wave of a hand, adorne makes it a delight to hit the lights. 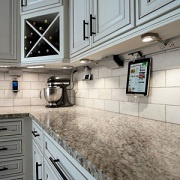 The adorne Under-Cabinet Lighting system brings an array of modular compents that swap out so easily, you will want to reconfigure whenever the mood strikes. From speakers and smart phone docks to lighting and outlets, there is a world of possibilities to choose from with these high-tech, highly convient building blocks. Are you so accustomed to the average outlet that you have never even imagined greater possibilities? Fortunately, we've spent a lot of time reinventing the ordinary - from an outlet that hides until you need it, to convenient in-wall smart device connections, and much more. 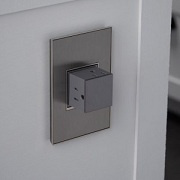 Plugging in has never been so stylishly convenient.